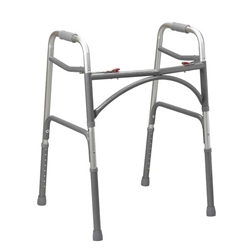 Drive Medical Bariatric Aluminum Folding Walker is a 2-button oversized walker with a heavy duty weight capacity of 500 pounds. The wider and deeper frame size helps accommodate larger individuals. It features steel legs and side braces for additional support. The precision design of the Drive Bariatric Aluminum Walker provides additional strength while adding minimal weight. The easy push-button mechanisms may be operated by fingers, palms, or side of the hand. Each side operates independently to allow movement through narrow spaces and greater stability whiles standing. 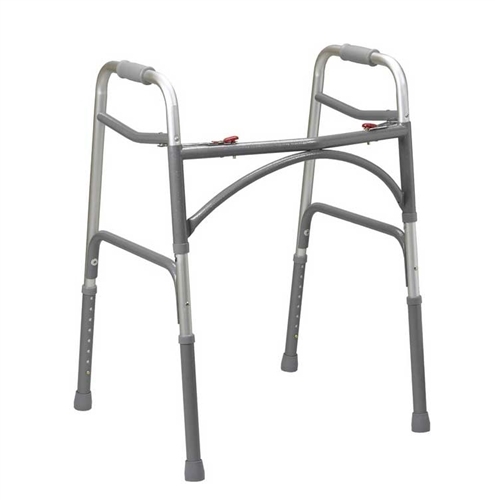 The large walker includes vinyl contoured hand grips for ease of use. Height Adjustable - 32" to 39"
Depth (Opening at Base) - 20"